Now open Monday from 9 a.m. to 5 p.m.
Women’s indoor soccer on Friday nights from 6:30 - 8:30 p.m. is a great workout. All levels welcome. Drop-in fee only $5. Clear the Hall - Beginning June 2, there will be no congregating in the lobby Monday – Friday between 8:30 a.m. and 2:00 p.m. Nannies will not be able to have children nap in the lobby during camp hours. Sorry for any inconvenience. Friday, June 14 between 9 a.m. – 3 p.m.
A picnic is a fun activity but remember to look around and dispose of all garbage, bottles and cans and food in the appropriate containers. A trashy environment invites all kinds of unhealthy creatures. Bottles left behind often wind up as broken glass. Keep it safe here for our children. Groups that leave a mess can lose future privileges to reserve the field or other areas. If you see a mess, please report it to the Rec Center office or call San Francisco Customer Service ( call 311 ) so that rhey can contact park maintenance. An after-dinner stroll can be a pleasant event. However, it can be intimidating when one happens upon a rowdy group that came to drink alcohol, smoke pot, and vandalize. 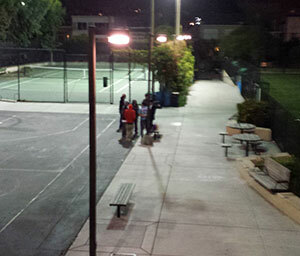 Damage to the tennis court nets, graffiti and broken glass are usual occurrences when groups of partiers are left to their devices. It is okay to remind visitors that smoking and drinking are not acceptable in the park. A call to SF Police non-emergency 415 553-0123 is suggested to report suspicious activity, especially if a sizeable group has formed. Ask that officers come by to check it out. It is not necessary to observe specific illegal activity. Concern alone is enough. Oftentimes, a passive gathering will get out of hand later after too many libations. Drinking, especially underage drinking, is a serious concern. Left uncheck, word gets out and partying proliferates. The park closes at 10 p.m. No one should be on the grounds after that. Park Patrol locks the gates when they come by. If gates are still unlocked after 10:30 call them at 415 242-6391. 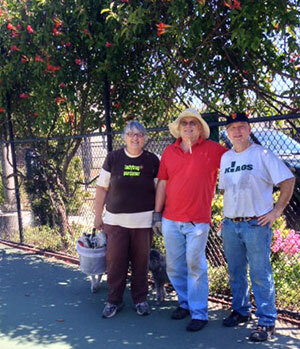 Join the enjoyable team sport of gardening on Saturday, June 14 from 9 a.m. to noon. Last month the Ladybugs made quite a racquet as they gained the advantage over the trumpet vines and undergrowth along the tennis court fence. The results are beautiful. Someone called out “Love all.” The Ladybugs appreciate the compliment. Contact Joan at ladybugs@noevalleyreccenter.com or just show up. Bring a hat and gloves. Bring family and friends, too. Children enjoy this activity. 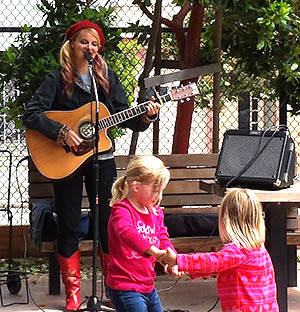 On May 24, our visiting musician, Lily Holbrook, had kids hopping with joy in the playground. Her lovely songs delighted grown ups, as well. While the music at the monthly Friends Concert in the Park is always child appropriate, the acts are quality entertainers who typically play for adults. History Day 2014 is gone but not forgotten. 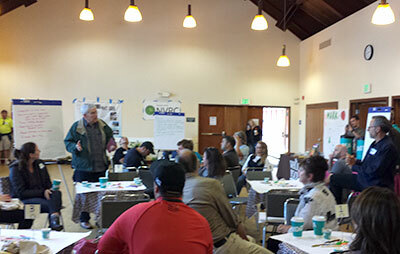 Neighbors, Rec & Park Staff and even Supervisors Chiu and Wiener used timelines, group discussions and flipcharts to amass personal experiences and public information about Noe Valley. They charted where we have been and then discussed our direction as a community. The plan is to have all of the feedback organized for presentation at next year’s event. 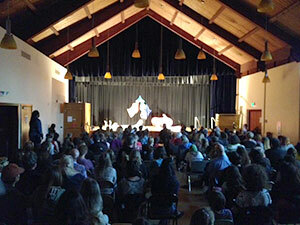 The auditorium was full for its first full drama production ever on Friday, May 9. Young actors from the So You Think You Can Act class at Upper Noe performed The Phantom Tollbooth. The stage is beautiful but much underused. Ask Cheryl at the Rec Center office about how your group might take advantage of this awesome community resource. 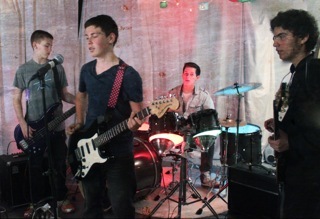 This month Friends Concert in the Park welcomes a youth band based in San Francisco. 12 Stories started playing together about four years ago and performs mostly original songs. This four piece combo just came out of the recording studio last week with two new original songs added to their repetoir. This tiled planter simply showed up one morning a couple weeks ago. 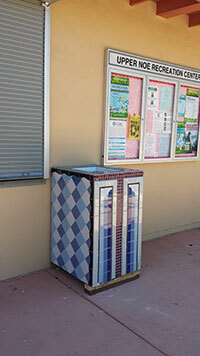 It is rather attractive and the colors work well with the blue donor tiles on the playground wall. No one knows how it got here. Its previously location was outside of the recently closed St. Paul’s Market at 29th and Sanchez. Considering how heavy it is, completely filled with potting soil, getting it here must have been no easy feat. Friends and park staff have decided to put it to the community: should it stay? If so, what kind of plant should we put in it? Send comments to info@noevalleyreccenter.com or speak to Cheryl in the office. The obvious often needs stating anyway. At user’s request, new signs went up at both entrances to Joby’s Run, also known as the Upper Noe Dog Play Area. Just as children take priority in a playground, dog play takes priority in a dog play area. 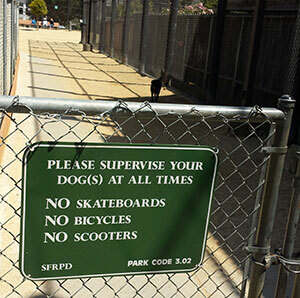 Bicycles, skateboarding and scooters are not appropriate there. Rather than risk collisions, spills and making dogs nervous, it is best to keep these activities separate. The signs are helpful reminders. Help shape programming and events at Upper Noe. St. Kevin Church, 702 Cortland Ave & Ellsworth St.